Thanks for checking out our site! 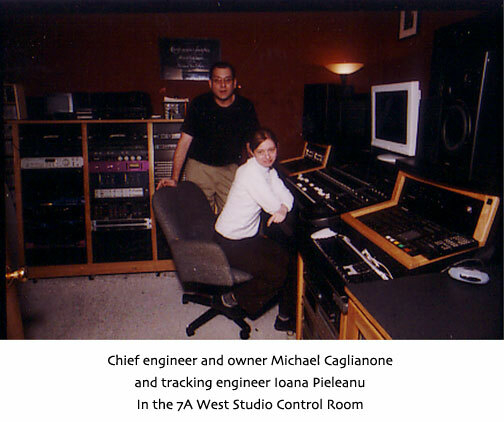 We are a full service audio production studio located in Charlestown Massachusetts, minutes from downtown Boston. We feature state of the art digital recording gear, a relaxed, creative atmosphere specifically geared to the artist (cool vibe!) and well trained, helpful engineers who know how to get the results you're looking for with your project. Our services include audio production and mixing capabilities for all styles of music from art rock to zydeco! Additional services include radio production, midi programming, mastering, sound design, audio restoration and archiving, and audio for picture. On our website you'll find everything you need to make an intelligent decision in your choice of a recording facility. We have provided a current list of clients, a complete list of past clients, a pricing guide, a photo gallery of the gear, room and clients hard at work, a complete and ever expanding equipment list, and free MP3 downloadable music files so you can hear our work online! Since opening as a commercial facility in 1997 we have completed over 750 projects in all musical genres and have produced many commercials for radio. We have produced and engineered many independent CD releases and have worked with many record labels including Elektra, Espo, Tautology, Sachimay, Pelado, Emanem, Telepathy, Raucous, and Twisted Village. We have received critical acclaim for many of our artists including Hyptonic, The Kings of Nuthin', The Photon Torpedos, Nmperign, Philip Tomasic, Masashi Harada's Condanction Ensemble, The Falsies, Waver, Underbody (formerly Used), The Crush, The August Spies and Ben Schwendener. Future plans include the addition of a ProTools/MixPlus system, more vintage gear by Neve, API, Neumann, Focusrite, and Pultec (among others) and continuing to build our collection of the latest cutting edge technology. We are currently searching for a larger space to increase our studio size and add additional rooms. Plans include the addition of an analog 2" room.